People from many different professions share the same obsession: biking. Featured here are some passionate bikers from various walks of life. "I bought my super bike, the MV Agusta for myself on Valentine’s Day, a gift for myself. I love the shape of this bike, its curves are amazing, like Latino gold." SG: I was interested in bikes since my childhood, I used to immerse myself in bike-related movies, documentaries, YouTube videos, anything I found about bikes. My father is also into bikes, so my interest in bikes kept growing. I think biking is a dangerous sport which I find very exciting and thrilling. That was what really got me hooked, I guess; the rush you get from it. My first bike was my dad’s Royal Enfield 1979 model. He used it and later passed it on to me. I modified it here and there and I even won some awards with it; for best modification. After that, I got a Suzuki GS XR 600. You can almost call it my first love; I saw it through exercise book covers and pictures and I really wanted to get one for myself. Luckily, I got to buy a second hand one. It was in horrible condition though, and I spent too much on just trying to get it working again. I eventually sold it. Any memorable biking moments you’d like to share? SG: A memorable trip would be the time I went to Manang with some of my friends. It was during Dashain so I got a scolding at home but it was definitely worth it. We went off at 3 in the morning and rode for fifteen hours. Two of the bikes broke down on the way and we ended up pushing them to the nearest place that could fix it, which wasn’t an easy feat. We stayed for two days. Your take on super bikes in Nepal and advice for people looking to buy one? 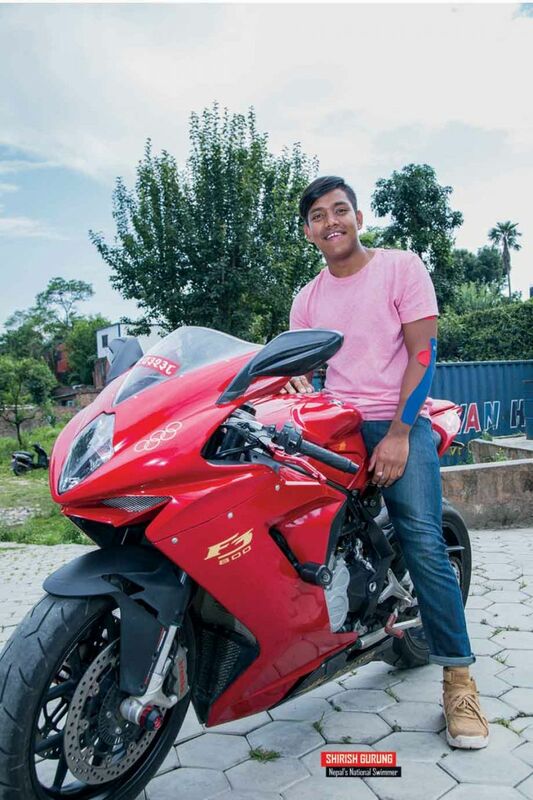 SG: In Nepal, super bikes have a bad reputation. People assume you’re spoiled when they see you with one. Super bikes aren’t made for the roads of Nepal but it is fun to ride them on weekends. I bought my super bike, the MV Agusta for myself on Valentine’s Day, a gift for myself. I love the shape of this bike, its curves are amazing, like Latino gold. Plus, it also has a single swing arm, which you don’t get in Japanese bikes. It’s an Italian bike and I like the performance as well. It’s a tri-piston bike, so you have the parts in pairs of three, like it has three exhausts. So, if you’re looking to buy one, just keep in mind that maintenance is difficult. You won’t find any of the parts or servicing here, so it will be a problem if it breaks down. "For newbie riders, I’d like to say that biking isn’t about showing off. Don’t try to exceed your limits with a really powerful bike immediately." PK: I’ve had an interest in biking since I was 17 years old, but there were gaps in between though. I had work to attend to but recently I’ve gotten into biking again. I used to watch my older brother and my father ride bikes. My father was more of a car person, but my cousins rode around town in bikes a lot. They were really into it and I followed in their footsteps with passion. The super bike I have right now is the CBR 360. I find this bike to be really road friendly, that’s what I love the most about it. You can ride it everywhere, it’s really comfortable to ride and it’s a Honda, so it’s the best bike. My first bike was a 150 cc Hartford. I’ve sold the bike but I remember my days on that one. The bike really started off the fun for me. I’d like to honor an H2 in the future, but I don’t think it’s possible. And I don’t have the money buy it, so there’s that. When I look for a bike, I look for comfort. I don’t want to be sitting in an awkward position when I’m riding the bike, and not have to lean too much forward. It’s a big bike, but you don’t feel it when you’re riding it. PK: There are many actually. I can’t put one before the other, as I have memories of biking now and also memories from back when I was just a teenager, a newbie. What I love about biking is that you get to meet people and it’s an amazing stress buster as well. My job is stressful and the tension builds up throughout the week until I get upset. So my wife tells me to go ride my bike and relieve the stress. After that I feel lighter. Four days after buying this bike, I went to Dhulikhel. It was a short ride but that was the best part. PK: For newbie bikers, I’d like to say that biking isn’t about showing off. Don’t try to exceed your limits with a really powerful bike immediately. It’s for you and not for someone else. If you make one mistake with a powerful bike, it’s over. "For super bikes, it’s best to have experience beforehand. It’s better to have experience because you don’t know what will happen, what will go wrong with the bike." 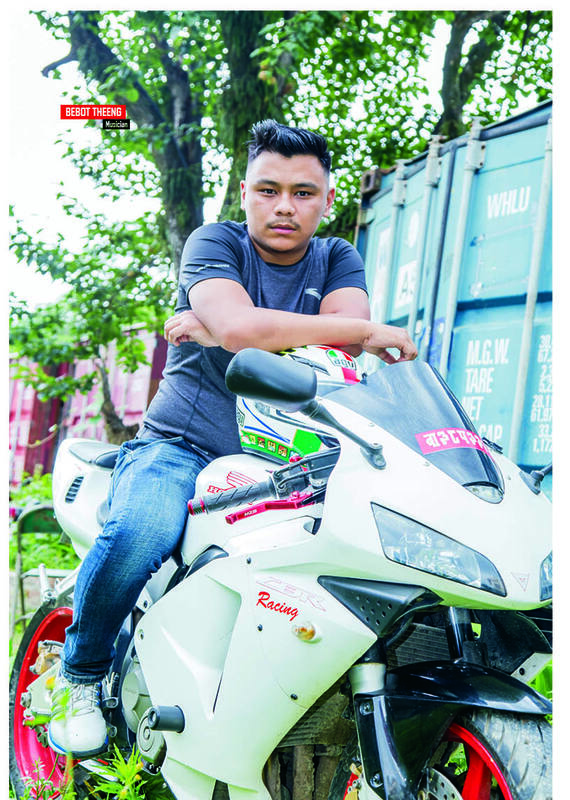 BT: Well, I got into biking because I really wanted to try it out after seeing professional racers such as Valentino Rossi and seeing them compete in races such as Moto GP. My first bike was the Duke 200, which I still have along with my current bike, the Honda CBR 600. 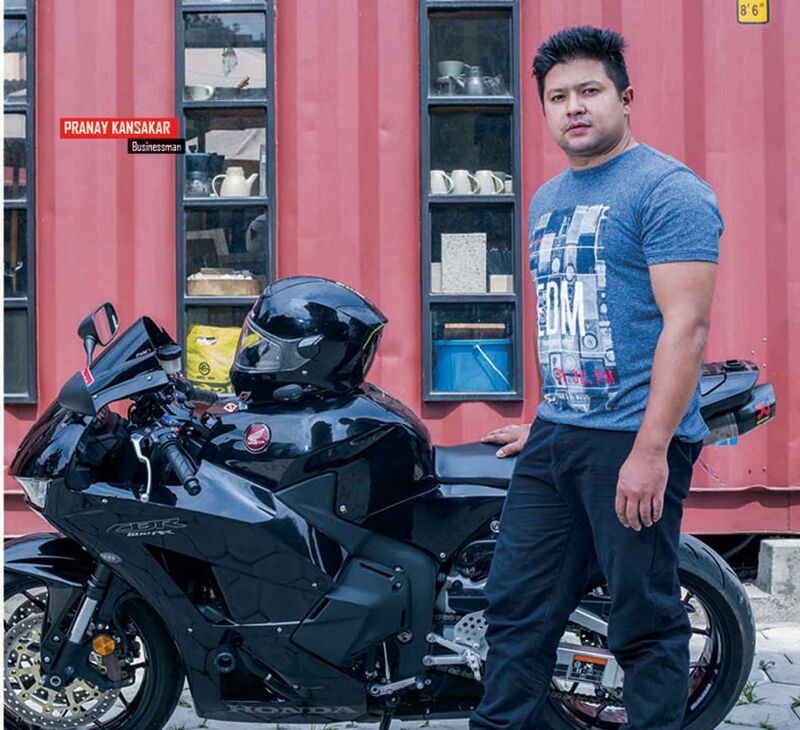 My favorite is the CBR 600, because since it’s heavier, you can really race with it but it’s not good for Kathmandu roads and more for outside roads. It’s more a racing model whereas as the Duke 200, on the other hand, is really good for Kathmandu roads and for city riding. I really got into biking for the thrill of it, since I got into from Moto GP races. I started riding from 2006, and when I had the Duke, I felt like it wasn’t fast or powerful enough. Especially in comparison to more powerful bikes. So, I bought myself the CBR 600 but with the new bike, it’s difficult to ride it here as it overheats due to the traffic jams. 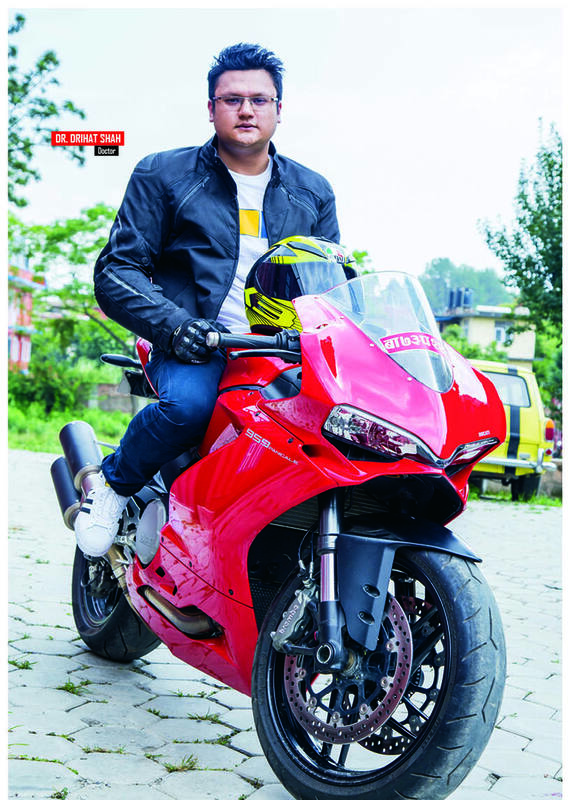 BT: Well, one would be the time I took my Duke out for a ride to Dolalghat, which is nearby Dhulikhel. My bike broke down there, the suspension didn’t work. So I had to call the guys at the KTM workshop here and at that time there were only like 50 to 60 places that serviced KTM bikes. We’d done the ride to kind of advertise the bike. Another experience that’s really memorable with the Duke was on the third day after I bought the bike. Since it was a new bike and it didn’t really have a silencer on it, when the police pulled me over, I thought they’d take my bike away because they were convinced that I had modified it. I had to call someone from the showroom to explain that the bike was not modified. That was scary, because I thought they were going to take my bike away. BT: For super bikes, it’s best to have experience beforehand. It’s only been a year that I’ve had the Honda CBR 600. It’s better to have experience because you don’t know what will happen, what will go wrong with the bike. Ride safe, don’t go jumping the bandwagon and buy a bike you’re not ready for. Start slow and move up. "For those looking to buy a superbike...find a bike that is comfortable and convenient." BS: As a teenager, I used see people riding these huge super bikes in other countries and I fell in love with the bikes and the biking thing. So at the age of sixteen, I started riding bikes, starting small. I bought my first bike, a Pulsar 200. I have had a lot of good memories with it but there is one bad memory I have with it. So when I bought it and took it out of the showroom to ride it, I fell from the bike. Other than that, they’ve all been good memories. What I love about biking is that we get to travel a lot, meet a lot of people and there’s always the thrill that’s present, it adds to the excitement of it. Right now, I have a Ducati Panigale 959 and I’m very happy and fortunate to have it. It has a huge torque, it’s a very powerful bike and also the sound, it’s full of raw power which you don’t get from Japanese bikes. It has a very strong pulling power but it is a hassle riding it in Kathmandu, as it’s a powerful bike and it overheats during traffic jams. BS: A memorable trip would be the time I rode to Nepalthok, there were six or seven bikes in total. It was nice because the roads were good and the weather was pretty. We stayed the night as well. It’s a good memory because nothing bad happened and none of the bikes broke down, thankfully. BS: For those looking to buy a superbike, I would tell them to separate their hobby from their passion. Find a bike that is comfortable and convenient for you because if the cc is really high and the position is also very aggressive, then chances of having an accident is high. So, I’d tell them to start small and slow. Start with a 250 cc bike and then if you are comfortable, go for a 600cc bike. Get yourself familiar with the controls. It’s a superbike so you won’t be riding it slowly either, so start small and go up.